This entry was posted in Twitter and tagged Andrew Collins, mystery, Twitter by Andrew Collins. Bookmark the permalink. Did you ever solve the mystery discussed on the podcast when you were walking down a street, and there was a crowd of business men cheering only certain passers by? I hope he is honourable enough to give you the name. However I have a suspicion he might have offered already if he were willing, because he already knows from your previous post that you want it. So perhaps not. It’s a bit harsh to describe Original Andrew as dishonourable for wanting to keep his name. Perhaps Andrew’s interest will encourage him to start Tweeting. Yes, we like the original Andrew Collins. He got here first. And … we got him Tweeting again after three years. I didn’t say he was dishonourable, I only said that it would be honourable to give the name to our Mr Collins, who would clearly make better use of it. I’m sure he’s a lovely person, but he’s not a tweeter. Good work private dicks. Now has anyone heard from @LordLucan or @JimmyHoffa? Great that he is alive but if he doesn’t give you his Twitter name I’m sure he wil be “sleeping with the fishes” before Friday. I was hoping to find out that Andrew Collins was actually Virgillio Anderson. I’ve read the comments in the first part of this blog, and realise that I was beaten to the Virgillio Anderson reference. Must try harder! I, Andrew Collins (the Yank), of Boston, do hereby offer my official Twitter name to the much more witty and prolific Andrew Collins (the Brit). After 11 Tweets in 3.5 years my thumbs are tired and I agree that my namesake in the UK is the appropriate owner and holder of this fine Twitter name. I suspect that I might regret this if I ever end up in jail in a foreign country with a blackberry in my pocket seeking bail money, but it is the right thing to do. Appropriately I would now say that Andrew Collins UK (AC-UK)is THE Andrew Collins. Go Red Sox. Stay out of Miami when a tropical storm hits. P.S. AC-UK you can reach out to me in a private message via twitter (I am following you now with the account), or if this post captures it, via my email address. We can arrange for you to take over the account, etc. Bravo to AC-US! Who is not without some wit of his own, clearly. A noble gesture from AC-USA. But don’t accept it. You’ll always be a Collings to us. In fact it was only after 3 months of the Collings & Herrin podcast that I realised your real name..
Nah, take it. It is your destiny. What a nice man AC-US is. Still he has missed a trick…I personally would have shafted you out a few quid. Kind gesture. But surely @Collingsa should live on. It’s a nice subversive note when you announce it on the radio. I agree with later posts. AC-US is both witty and honourable in his preparedness to sacrifice his twitter name. But, like the angel of God before Isaac’s sacrifice, you should stay the knife. Besides, CollingsA is a cool name, and it has kinda stuck. You wouldn’t want to be obvious, now, would you? 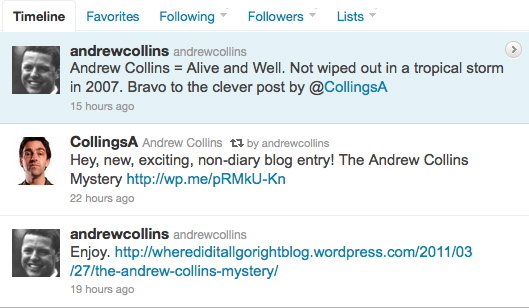 become @andrewcollins – you’d be mad not to! Finally had time to watch Secret Dancing. To be honest, I wasn’t sure whether I’d like it or not, and originally only bought it as a “thank you” for the podcasts, but I genuinely enjoyed it. It now resides next to all of Richard’s DVDs. which I’m sure he would (in character) hate as it isn’t worthy. You did seem to sweat rather profusely though! Nowhere near Lee Evans levels though, obviously. I couldn’t decided whether it was due to your decision to turn the house lights to full, down to nerves, or a combination of both. Nice to see Lucy on the 6 Music extra too. I always did wonder what she looked like, so now I know!